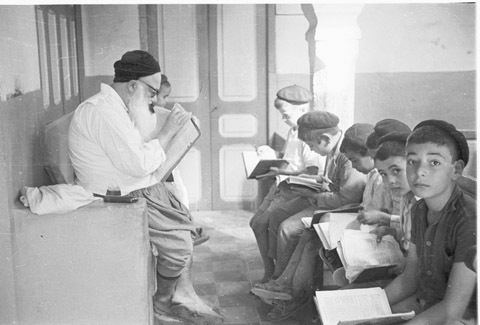 JDC - Archives : Students in the JDC-supported school in Medinine learn the torah from the Grand Rabbi. Title Students in the JDC-supported school in Medinine learn the torah from the Grand Rabbi. Description Students in the JDC-supported school, learn the torah from the Grand Rabbi of Medinine, Houita Houri.